We'd just finished wiping the drool off our chins from the 2013 Porsche 911 Cabriolet reveal earlier this week at The Detroit Auto Show when ze Germans rolled out the all-new 2013 Porsche Boxster. This third-generation Boxster's dropped weight, added width, piled on the power and improved the car visually in every dimension. Activate salivary glands! Starting from the sheet metal and working inwards, the most obvious change is a crisper, more countered exterior. Up front is a new set of gorgeous elongated headlights that look similar in shape to the Porsche 918 RSR. 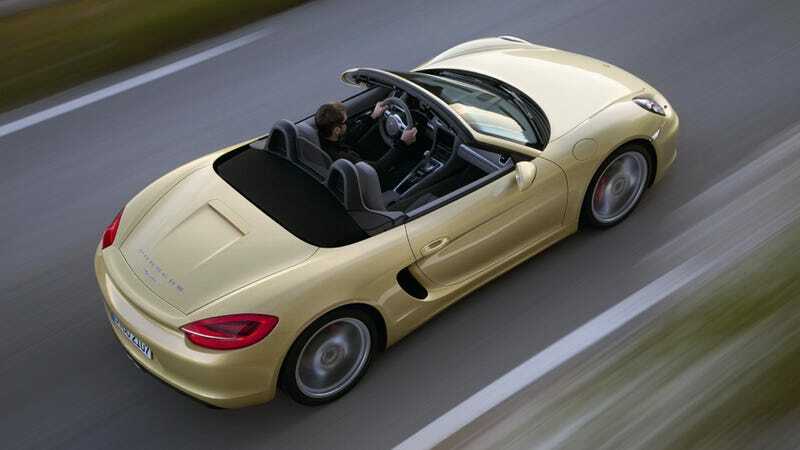 In profile there's a deeper scoop and longer track giving the 2013 Boxster the look of a Porsche Carrera GT. The most dramatic upgrade is the taillight, which has a ridge that blends into the spoiler. Super trick. Super impressive. Inside the Carrera GT look continues with a wide center console inspired by the supercar that's now the standard across the Porsche brand. There's also more room due to the wider track. Lest you think the new Boxster's been munching on too many schnitzels, they've also dropped around 77 pounds. Power is predictably (in a good way) up with the latest base model offering 265 hp from its 2.7-liter direct-injection flat-six. The Boxster S squeezes an additional five horsepower out of its now 315-horsepower flat-six. Both engines come with a six-speed manual stock and a seven-speed PDK as an option. With the Doppelkupplungsgetriebe transmission the base Boxster hits 60 mph in 5.4 seconds and the Boxster S rips off the same distance in just 4.7 ticks. Fuel economy is also improved, or something. The new Boxster goes on sale in the U.S. early this summer with a starting price of $49,500 for the base model and $60,900 for the Boxster S, both before a $950 destination and $30 Porsche hat charge.